This year, the FIA Formula One World Championship is set for a wholesale change of the technical regulations that have doubled the power of the KERS system. because of the harvesting demands of the energy recovery systems, rear braking can be controlled electronically for the first time. Because the ERS (Energy Recovery System) is so much more powerful on these new cars compared to the KERS on the 2013 cars, harvesting energy when the car is braking – 161bhp of energy compared to 80bhp with the KERS – it is essential that the engineers install a system to compensate for the powerful effect that has on brake balance and braking stability. This makes it acceptable for the driver and doesn’t destabilise the car with a sudden balance shift. A lot of the lap time in modern F1 comes from stable braking. An F1 car has two brake systems for safety – front and rear – so that if one fails the other will stop the car. For 2014, the rear brake system has the brake-by-wire, which assesses how much brake pressure the driver has called for when he presses the pedal and an electronic system modulates the power to the rear brakes, allowing for the ERS effect, that is taking energy to charge up the kinetic motor generator unit (known as MGU-K). It smooths out the process, slowing the car in a consistent way at the same time as ensuring the maximum energy harvest for the ERS. Ideally, the driver would feel nothing unusual with this system, in that it should provide consistent, stable braking on demand. The job of the new rear brakes system is to ensure consistency. Some people might argue that the electronic assistance to the driver makes it a “driver aid” and in the sense that without it, it would be difficult to maintain a brake system that the drivers would be happy with. This damps it out. But as it’s written into the regulations it doesn’t fall foul of the regulation saying that the driver must drive “alone and unaided” – a rule that prevents the use of traction control, ABS and countless other technical goodies. 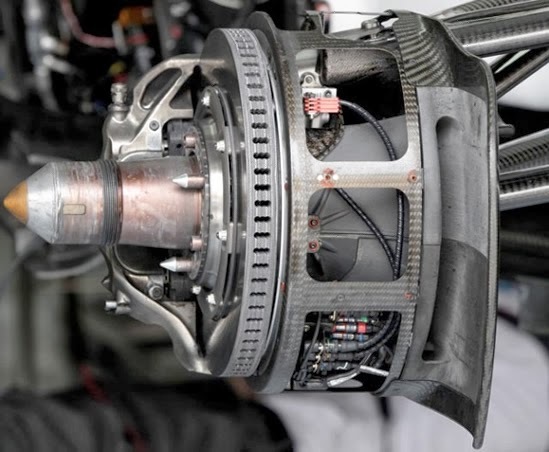 While FIA and pit lane boffins label everything with an acronym and make it sound overly technical, effectively formula One cars are adapting the 'brake pedal feel simulator' that most road car hybrid drivers, especially Chevy Volt owners, will be very familiar with, and from all reports it's taking the drivers some time to get used to it.